Griffin Heat Shield Company’s Super Hand Cooler is truly the best hand/arm protector on the market today. 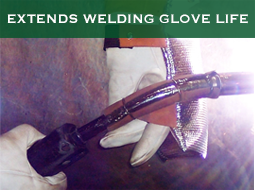 It can be used in all types of welding applications such as: GMAW (Mig) welding, flux core welding, SMAW (stick) welding, heli-arc welding, plasma arc burning and oxy-fuel burning. 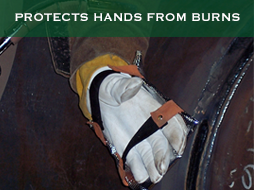 In 1995 the “Griffin” heat shield or backhand pad was the first completely reversible heat shield on the market. 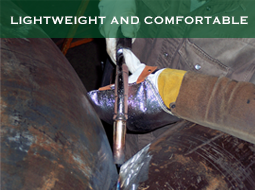 Our product is lightweight and pliable, providing the welder maximum comfort and flexibility. Check out our other products: Super Arm Cooler, Cool Blanket, Tig Finger and our brand new (2015) Welders Kneeling Mat on our Products page. Find a Griffin Heat Shield product at a store near you.